I tried to do live thoughts for Night of Champions but quickly realized my comments weren’t that witty or entertaining. So instead, this is the standard thought on the show after the fact. First though, I want to address something that was brought up on the 9/13/12 episode of From the Rafter’s Radio. During the PPV prediction segment, Kevin read my predictions on the air since I couldn’t call into the show. True, my predictions were full of snarky comments. Rafter’s Radio Producer, Chris Hagstram brought up how I was really bitter and wondered why I felt that way. I think the line up and build to Night of Champions illustrates my current frustrations with WWE. Before we get into the show let me use the card to show why I have a hard time being positive when talking about WWE. -- U.S. champion Antonio Cesaro vs. winner of pre-show battle royal for U.S. Title: Before Antonio won the U.S. Title at SummerSlam, he had not had a real feud or storyline in WWE. Since winning the title, the story has been more about Santino Marella’s cobra being attracted to Antonio’s valet Aksana more than having anything to do with Antonio. Now for Antonio’s first PPV title defense, he’s competing against a random opponent that will be determined on the YouTube preshow. I have no problem with using a battle royale to give someone a title shot. Just think the battle royal could have been done on RAW and then WWE could have spent 6 days building to the match. The big question will be who is involved in the battle royal. Will there be some guys who have a believable shot at upsetting Antonio Cesaro and taking home the U.S. Title or will it be guys like Tyson Kidd, Curt Hawkins and Yoshi Tatsu? Not discounting the talent of those guys, but none of them have done anything in the past year to make me interested in seeing them in a title match. While Santino was U.S. Champion, the title was rarely defended and Santino spent most of the time in a feud with a ring announcer. WWE needs to work on adding prestige back to the U.S. title. -- IC champion The Miz vs. Sin Cara vs. Rey Mysterio vs. Cody Rhodes in a four-way match for the Intercontinental Title: I have no major issues with this match. If I wanted to find something to be nitpicky about it would be the possibility of Sin Cara becoming a champion. I don’t feel he’s really connected to the WWE crowds yet. Given his lack of speaking, I am curious if he can really be placed into a meaningful feud. It is good to see him fighting someone on PPV not named Hunico though. -- WWE tag champions Kofi Kingston & R-Truth vs. Daniel Bryan & Kane for the Tag Titles: I get the appeal of Kane and Daniel Bryan being a tag-team. That doesn’t mean I want to see them as wacky tag team champions who don’t get along. The actual tag teams on the WWE roster are teams that can put on good entertaining matches. The Prime Time Players are actually getting over, even without Abraham Washington. Instead of building up the tag division and putting and emphasis behind actual tag teams, WWE is taking the cheap road by putting Kane/Bryan into a title match. Will the tag titles add anything to their teaming? -- Randy Orton vs. Dolph Ziggler: As I said on From the Rafter’s Radio, I have never understood the appeal of Orton nor the WWE’s insistence on shoving him down the throats of the fans in order to make him a star. Orton is bland, boring and is lucky to use one of the most popular finishers from the Attitude Era. Given Orton’s behavior behind the scenes and his recent suspension, I don’t understand the continued desire to push him as a top star. On the flipside, Dolph Ziggler shouldn’t be a future star. He should be a star now. Something in the WWE booking philosophy however dictates that until Dolph can cash in the Money in the Bank briefcase, he must lose the majority of his matches. I understand Daniel Bryan had the same losing streak before becoming champion and once he was champion is when he became popular. Though I tend to believe Bryan’s popularity was more due to the ease of chanting, “YES!” no matter what was happening on the show more than fans clamoring for DB. If WWE has big plans for Dolph and want him to be a successful champion, why not get behind him before he has the title? -- Divas champion Layla vs. Kaitlyn for the Divas Title: WWE doesn’t care about women’s matches. Why should I? -- World Heavyweight champion Sheamus vs. Alberto Del Rio for the WWE Title: How many times will Sheamus defeat ADR? What has ADR done to make me care about him getting another title shot? Wrestling is a sport where the objective is to beat your opponent. Part of the way that happens is using moves that cause damage to your opponent. What is the logic of banning Sheamus’ Brogue Kick because it can cause damage? -- WWE champion C.M. Punk vs. John Cena for the WWE Title: Last year CM Punk defeated John Cena at Money in the Bank and SummerSlam. CM Punk has been WWE Champion for nearly 10 months. In that time he has defeated Dolph Ziggler, Chris Jericho, Daniel Bryan, The Big Show and John Cena on pay per views. Yet for some reason CM Punk can’t be considered a great champion until he defeats John Cena in Cena’s hometown. I have no doubts the match at Night of Champions will be entertaining. I simply don’t like the way CM Punk has to constantly play second fiddle to John Cena. I don’t have a problem with Cena being the face of WWE. What I do have a problem with is Cena constantly getting the main event slot or having his feuds presented as more important than the WWE Champion. Scott Stanford opens the pre-show by saying he’s going to update us on the condition of Jerry Lawler. 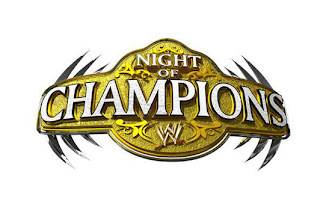 Than says Michael Cole will update us at the start of Night of Champions. They’re replaying the Sheamus disposition from RAW. As good as the Anger Management segments were, this was just bad. Sheamus is Jewish-Irish? Really. Booker T. tells Josh Matthews the Brogue Kick is still banned. Will Sheamus use it while the ref is down, or will he get disqualified for using it out of desperation? Wow! A package to put over Antonio Cessaro is airing. Why not put this on RAW or Smackdown? If it aired on Smackdown, then I take back my complaint. The battle royale participants are on their way out. We have Brodus Clay (with both Funkettes), Primo and Epico, Justin Gabriel, Tensai, Tyson Kidd, Michael McGillicutty, Zack Ryder, The Prime Time Players, Jinder Mahal, JTG, Drew McIntyre, Ted Dibiase, Heath Slater, and Santino Marella. Look at that list and see if you can pick the top two guys who actually have a shot of winning the battle royale. For the record I’m picking Brodus or Santino. Everyone eliminates Heath Slater because they hate Gingers. Ted Dibiase has been eliminated. Brodus eliminates Primo, Jinder Mahal and Epico. Tensai sends Gabriel flying to the outside before tossing Tyson Kidd onto the pile of eliminated stars. Tensai and Brodus have a stare down before doing the two big guys beat each other up spot that’s popular in battle royals. Three people eliminate Brodus. Santino eliminates JTG. Zack Ryder eliminates Drew McIntyre and YouTube freezes. Santino tries to pin Tensai and Darren Young. The Prime Time Players eliminate Santino. Okay, I was wrong. Should have gone with my third choice, Zack Ryder. Ryder eliminates Michael Tarver. Tensai tries to eliminate Ryder and Young but Ryder hangs on to the rope. Ryder then eliminates Tensai to win the battle royal and will challenge Antonio Cessaro tonight for the US title. Opening video puts over past champions while saying CM Punk doesn’t care about the title. Punk just wants respect. The show opened with the Fatal Four-Way for the IC title. This was a solid if unspectacular opener. I’m a bit disappointed Rey Myseterio and Sin Cara actually faced off at points in the match. If the rumors of them fighting at Wrestlemania are true, I would have teased them fighting only to have Miz or Cody Rhodes attack and stop Rey and Cara from fighting. The Miz picked up the victory after hitting Skull Crushing Finale on Cody. Like I said, decent but nothing to get excited about. Next up was the Tag Team Title Match. As I predicted (or feared) Daniel Bryan and Kane won the Tag Team Titles. After the match each man was shouting, “I am the Tag Team Champions.” Expect more wacky comedy and burial of real tag teams to get over two guys hugging. Maybe Jeremy Piven can return to promote a Hug It Out match at Hell in a Box. The match itself was solid. Antonio Cesaro retained the U.S. Title with a pin fall victory over Zack Ryder. It’s amazing how over Zack was a year ago and how nothing really came out of it. He still got several cheers from the crowd but in my opinion, Zack needs to evolve. The character feels dated and because Robbie E. actually gets TV time in TNA, Zack is starting to feel like the rip off. As is the theme of the show, there was nothing terrible with the match but by the time RAW airs on Monday, this match will barely be a memory. Dolph Ziggler continued his “Looking at the Lights” tour with a loss to Randy Orton. The crowd was really into the match while I was busy playing Song Pop on my phone. I don’t care how many matches Randy Orton wins, I don’t enjoy his matches and when he starts pounding the mat all I hear is Robert Downey Jr. screaming, “Don’t go full retard!” I think I’d rather watch the Submission Squad in a 60 minute Iron Man match then watch a Randy Orton match. If Dolph Ziggler cashes in the MITB briefcase anytime soon, every title match he has will have me thinking he’s a transitional champion. Jeff Gillooly must have been hanging out backstage as Kaitlyn had her knee attacked while she was warming up. Since Kaitlyn wasn’t able to compete, Booker T. announced Eve would get the Diva’s Title shot. How long until we find out Eve was the one who attacked Kaitlyn? In the surprise of the night, Eve won the Diva’s title. I think the crowd was in a stunned silence throughout most of the match. Either that or they were all out buying their John Cena Rise Above Cancer shirts, as the arena was really quiet. Sheamus not only defeated Alberto Del Rio for the 20th straight time, he also made Del Rio’s submission hold look like a joke. Del Rio had his arm breaker on Sheamus several times for long periods of time yet Sheamus managed to get out of the hold every time. Before the match Booker T. announced the Brogue Kick was reinstated thus killing any real drama the match could have used. Knowing Sheamus could use the kick meant not having the use of one arm wasn’t going to be that big of a hindrance. Hopefully now Sheamus can move on to a new challenger. The ending of the John Cena/CM Punk match gives me mixed feelings. On the one hand I don’t want to be THAT guy who complains about a PPV match not having a true finish (even though I am THAT guy who’s doing nothing but being bitter and negative about the show) On the other hand, the ending of the match was very anti-climatic and exposed an issue I have with current wrestling. Before I talk about the finish lets look at the match itself. As expected the match was very good and both guys had clever reversals for their opponent’s signature moves. I wasn’t crazy about all the “finishing” moves used throughout the matches. I dislike seeing wrestlers kick out of finisher after finisher. It’s one of my biggest pet peeves about Indy wrestling. I am more tolerant of it happening in main event matches than undercard matches, but it should still be something that is used sparingly. I was surprised at the lack of interference by Paul Heyman. Still wondering what his association with Punk is all about. Now, the finish. John Cena gave CM Punk a German Suplex off the top rope. The referee made the three count and immediately Cena’s music started playing while Justin Roberts announced Cena as the new WWE champion. After Cena grabbed the belt and celebrated for a few minutes, the referee got the belt back from Cena and informed Cena both his and Punk’s shoulders were down for the three count. Justin Roberts then announced the match a draw. Punk hit Cena with the belt laying Cena out in the middle of the ring. Punk and Heyman walked off together as the copyright singled the end of the show. First, why did the music hit and Justin announce the winner before the referee announced his decision? I get they wanted to get a positive reaction from the crowd. Second, the ending did nothing to advance the story or help CM Punk’s quest for respect. I’m guessing John Cena will come out on RAW and claim Punk didn’t beat him so Punk still isn’t that good. We’ll then get another rematch at Hell in the Cell next month. Overall, if all you want is three hours of solid wrestling, Night of Champions was a good show. If you wanted results which would signal a change is coming to WWE, Night of Champions wasn’t that show. The WWE creative train keeps chugging along on the same tracks. I realize this review was very negative. I wish I could look only at the positives and not be so critical. Unfortunately if you only focus on what was good while ignoring the bad it signals you’re willing to accept anything and nothing will change. Not that anyone from WWE is reading this and even if they were I doubt my poor ramblings would cause them to re-evaluate their storytelling. As long time readers may have noticed (probably haven’t and that’s okay) my output on my123cents has been spotty over the last couple of months. Part of that is due to my work and social schedule keeping me busy. The other part is with WWE not entertaining me, TNA being good but not really having anything I feel like writing about and my Chikara viewing limited to every couple of months, I don’t have a lot to say. I have a few topics I would like to write about but haven’t been able to organize my thoughts. Thankfully Kevin comes up with random topics to write about that don’t focus too heavily on show recaps. He also has some new ideas he’s going to be unveiling in the coming days. Hopefully the output of the blog will still be up to the level you’ve come to expect. Personally, I thank all of you for your continued support. What did you think of Night of Champions or what do you think about CM Punk’s title reign? Share your thoughts on Facebook or Twitter.